Ms. Shalini Kamath is an Independent Director on the Board of Borosil Glassworks Ltd. and Graphite India Ltd. She is also on the Advisory Board of TRRAIN (Trust for Retailers and Retail Associates of India). She is the Chairperson for FICCI - Women on Corporate Boards Mentorship program. She is a Certified and practicing 'CEO & Leadership Coach. She has close to three decades of work experience in three distinct fields - Human Resources, Business Development and Social & Community Development and across two continents - India and Africa. Her Human Resources Career spans close to a decade and half with Group HR Head positions for Chevron Texaco India ( Oil & Gas), Star India ( Media & Entertainment ), KPMG India ( Consulting, Audit & Taxation) and Ambit Holdings ( Financial Services & Investment Banking ). Apart from reporting to the Group CEOs, She was a key member of the Executive Leadership Team in each of her assignments. She has designed and introduced various programs related to 'Start-Up' Management, Cultural Integration, Change Management, Organization Capability Development, Redundancy , Policy formulations, Talent & Performance Management, Remuneration & Benefits, Employee Engagement & Welfare, Corporate Social Responsibility, etc. She is a 'Strategic Partner' to the businesses in providing business linked people solutions through change, renewal and transformation. In addition, her role in managing the Corporate Communications function at Ambit Holdings has given her the experience in building a strong Corporate Brand, both externally and internally. Prior to her roles in HR, she was the Deputy Marketing Director at Raytheon India. She was responsible for Business Development as well as management of large multi-million dollar programs in the areas of Defense & Commercial Electronics and provide support towards EPC contracts for large infrastructure projects across India. 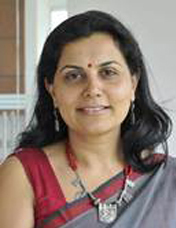 Ms. Kamath began her working career in Zambia and Botswana in Southern Africa. Over a decade, she worked with the Governments of both the countries on several Educational, and Social & Community Development projects. She acquired extensive experience in tripartite partnership projects related to community oriented income generation programs. She is a member of the HR Committee of Bombay Chamber of Commerce & Industry (BCCI). She is an excellent communicator and has addressed several forums and seminars. 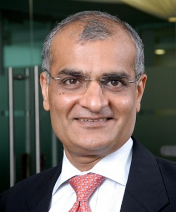 Mr Shah has spent over 25 years in the corporate and financial markets sector and is one of the leading spokespersons for the industry. He is passionate about financial services and the role it can play in translating India’s vast savings into investments; thereby powering economic growth and development. Under his leadership, Edelweiss has combined technology, innovation and growth oriented entrepreneurship with a strong focus on risk management to become one of the more successful, stable and well respected financial services companies in India. Finance Asia, Hong Kong ranked Edelweiss as India’s Best Managed mid-cap company in 2013 and 2014. A regular commentator on macro- economic policies, development matters and financial markets in the mainline and financial media, he serves on the Boards of various companies and public institutions. He has previously been on the Executive Committee of the National Stock Exchange and also on the SEBI (Stock Exchange Board of India) committee to review Insider Trading Regulations. He currently serves as Chairman, Maharashtra Council of FICCI and is a part of the Directors Forum formed by corporate stalwarts under the aegis of the FICCI Center for Corporate Governance seeking to improve the quality of board-level governance in Indian industry. An MBA from Indian Institute of Management, Ahmedabad, he also holds a Diploma in International Trade from the Indian Institute of Foreign Trade, New Delhi. A voracious reader, a fitness enthusiast and an avid runner, he has recently participated in a triathlon and continues to participate in marathons across the globe. Ms. Anjali Bansal is Managing Director of Spencer Stuart India, which she was instrumental in establishing. Based in Mumbai, she also co-leads the firm’s Asia Pacific Board & CEO practice. Anjali works in various geographies across the United States, Europe and Asia, advising companies on Board governance, CEO and senior executive search and succession planning. Earlier, Anjali was with McKinsey & Company in New York and Mumbai. She is a recognized expert and a frequent commentator on Corporate Governance, Board and CEO succession. Anjali serves on the boards of GlaxoSmithKline (GSK) Pharmaceuticals India and Bata India Limited. She is on the Advisory Board of the Columbia University Global Centers and a trustee of the United Way of Mumbai. Previously, she chaired the board of FWWB, a leading development and livelihood promoting institution. She chairs the FICCI Women on Corporate Boards programand is a Charter member of TiE. She serves on the Managing Committee of the Bombay Chamber of Commerce and Industry and of the CII Women Empowerment Committee. She has been listed as one of the ‘Most Powerful Women in Indian Business’ by Business Today and by Fortune Magazine. She received a Master’s degree in International Finance and Business from Columbia University, New York and Bachelor’s degree in Computer Engineering from Gujarat University.